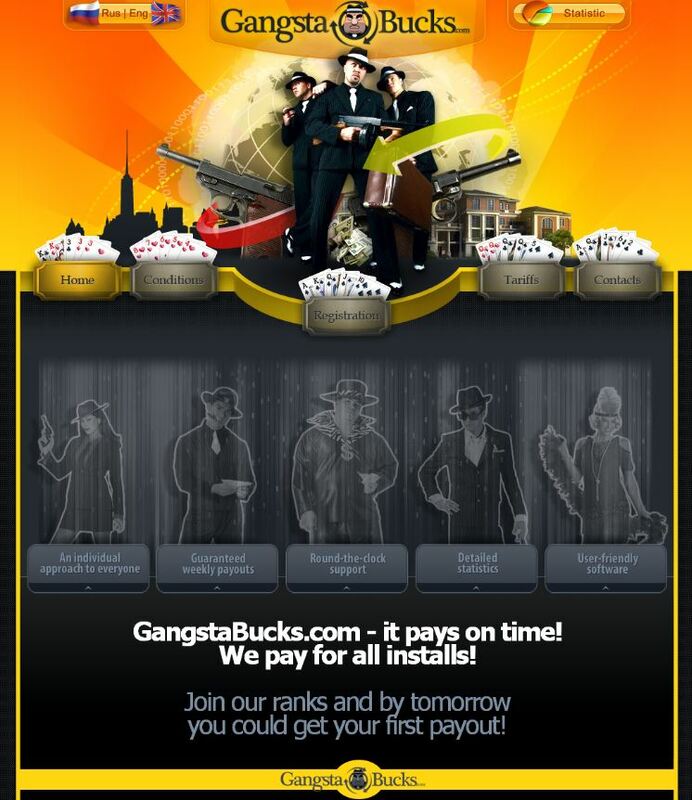 I see that Michael Child, has spotted, yet another TIG-like blog revival and possibly with another bogus webmaster, not the mysterious Mr Fox this time but a Mr Jake Gate for those readers good with anagrams. Although branded as 'Thanet Conservatives' this is visibly a TIG-style weblog #3 and is pictured below. However, it has already changed its front page and you can find the original in the TIG archive. It is depressingly familiar and of similar style, typeface, choice of colours, juvenile bad-spelling and syntax to its sad and somewhat demented predecessors; the others having been lost in mysterious circumstances, leaving behind only the TIG archive, that I saved from digital oblivion, as evidence of their former existence. 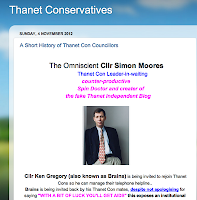 This new weblog holds a very nasty sting in its tail and not simply because it links to a number of defamatory allegations in former Councillor, Mark Nottingham's weblog, as some kind of attempt to present tenuous evidence to support their vague arguments against Thanet's Conservatives. Readers may recall that Mark Nottingham was deselected by the Labour Group at the last local election and was also the subject of a private and expensive legal complaint involving allegations, made in his weblog and elsewhere. That nasty sting, flagged by Michael Child in his weblog report and which I can confirm, is that Mark Nottingham's defunct weblog may be infected with an unpleasant payload according to Google which flags the presence of potentially malicious code or scripts when its 'bots' crawl the Web for content updates. Anyone whose own anti-viral protection isn't absolutely up-to-date, may risk potentially catastrophic consequences, if they follow the embedded link. 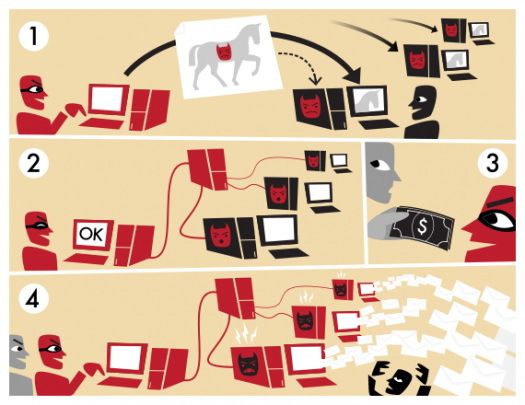 I have deliberately not included this link here to avoid the possibility of being party to any reader's Personal Computer disaster. As I happen to be somewhat involved with the PC security industry on a professional basis and I prefer to pay attention to Google's caution as I know how easily weblogs can be infected with malware and how frequently they are leveraged as attack platforms in the business. Quite how anyone' could be so stupid or malicious as to embed a potentially poisoned-link in a blog page, I really don't know but it's possible that whoever did this now has a PC which has the digital equivalent of a 'dose of the clap' and is 'owned' by a Russian serious and organised crime group and its resources or information can be accessed at will. I will let readers draw their own conclusions on who may lie behind this new weblog, their motives and sadly, their complete lack of intelligence but please make sure your AV is up-to-date and follow any embedded links to former Cllr Nottingham's fantasy revelations at your own risk! 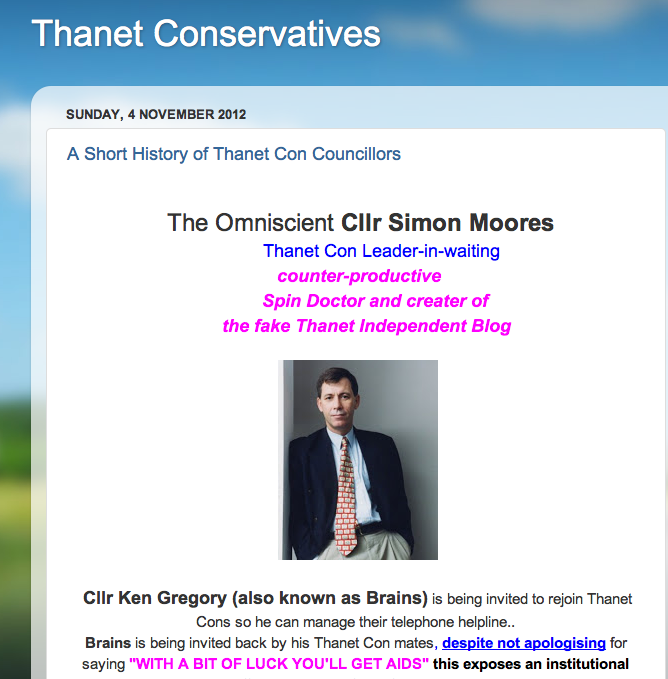 To be honest Simon when I first saw the blog name I thought the Conservative group had finally managed to produce a united web presence where senior members of the group were blog authors and were going tell us what they were up to. My first reaction was disappointment, it really does need one of the two main parties to take the lead on this one and use the internet to engage with the local electorate, difficult I know, but the police chief election is a prime example of what happens when there is little or no public engagement. I guess there this was a case of an American recommendation that didn’t realise how far behind we are with ITC in the uk. The embedded video, which does seem to have been made and posted by a Conservative group member also caused me some confusion, do you have an opinion about the video? Parish councillor with a personal opinion who chose not to consult on the subject with anyone else! I would have thought all the more reason for the Conservative group to have a defined and coordinated web presence using the main internet tools twitter, facebook, youtube and blogger. My guess is, come the next local election you will have to do this anyway and if group members haven’t had a chance to practice using it, then a mistake could lead to serious problems. Youtube has the facility to live stream meetings now, perhaps the Conservative group would consider live streaming shadow cabinet meetings, that sort of a move would make it very difficult for the other groups not to do likewise. I think people are looking for good and transparent local government, do you think this too? Well Simon we are down to one local paper, you are getting about 500 views a day here and TDC has no overall majority at the moment, which suggests it doesn’t actually take that many voters to tip the scales. I don’t think you need a team of web editors, just making each senior councillor a blog author showing them how to post and letting them get on with it, telling them only to post about their gardening or something until they get the knack of it ought to do the trick. When will Parish Councillors realise that they are not REAL Councillors. So many of them think they're Barak Obama its sad. And a lot of REAL Councillors just take the money and do nothing unless they're going to get their picture in the paper. 1:08 As a parish councillor I am more than delighted to tell you I do not think I am Barack Obama. Tell me though, out of interest, what exactly is a real Councillor. Maybe an electrician with a bad back, or someone with a phobia about his sexuality or maybe a single mum who should be looking after her kids. Me, I am just a person with a bit of time who tries to use it to further the needs of my own little community. Sorry if that is not important or weird enough for you. Like I said. You take yourselves way too seriously. PS No I'm not involved in politics. I just have to clear up the mess most politicians leave behind. 9:11, you take arrogance to a new high. Dismissive of parish councillors, though many work hard for their small communities for no reward and self opinionated enough to think you are our salvation from politicians. You are not the reborn Messiah by any chance?